Now- It is used to give the current date and current time. Today – It gives the current date. 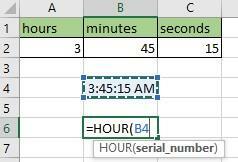 For extracting year, month, day from a given date we have predefined functions provided by excel. It takes one argument as shown below. TIME- It takes three arguments namely hour, minute, second. It is used to get time if above mentioned parameters are given. 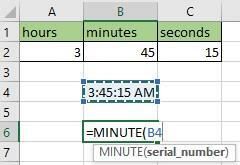 For extracting hour, minute, seconds from a given time we have predefined functions provided by excel. HOUR – It is used to extract hours from given time. It takes one argument. MINUTE- It is used to extract minutes from given time. It takes one argument. SECONDS- It is used to extract seconds from given time. It takes one argument. It is used to get the total working days between start and end date excluding holidays. It gives the working days between start and end date excluding holidays.